It was an endearing symbol of the ‘60s, but the iconic Volkswagen Van has since becomes a sought-after and expensive collectible. And while you can’t quit your job and drive across the country in this VW Van cooler, it’s a slightly cheaper way to dodge grown-up responsibilities—at least for a weekend. 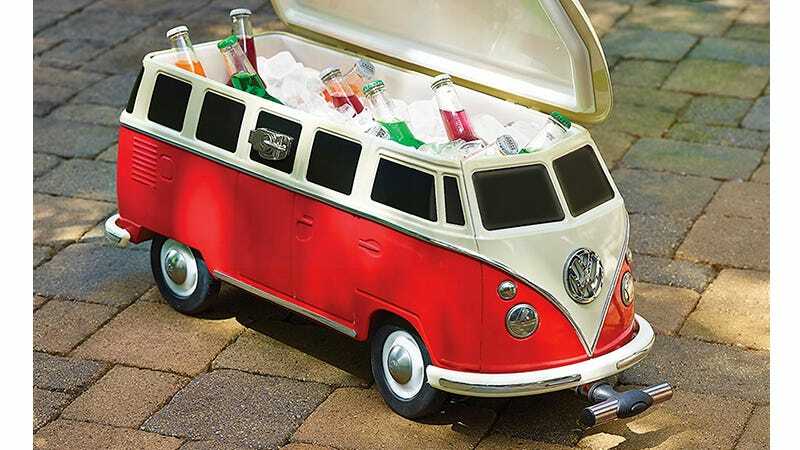 A two-feet long telescoping handle lets you drive the cooler to wherever refreshment’s needed, while its four eight-inch rubber tires should easily traverse everything from grassy parks, to wooden decks, to sandy beaches. The cooler has enough capacity to hold up to 24 16-ounce bottles plus ice, while a drainage hole hidden near the back bumper makes it easy to empty when the party’s over.